I can't even find my original source for the names; when I look now I find a lot of different ancient writers using different combinations of them. Oh well, the names aren't important. I baptised these scales and put them in the book and then promptly forgot about them. While chasing down some things about Melodic Minor b4 yesterday I bumped into them and thought maybe it's time they had their fifteen minutes on this site. The CAGED fingerings for these scales are jumbles of semitones that all look alike and they rarely contain anything that looks like a familiar triad or seventh chord. So this isn't the most useful way to look at them. Instead I thought it might be interesting to view them vertically, as patterns along a single string. You get slightly more benefit from seeing two copies side-by-side -- this allows you to play in a more positional way if you want to. The advantage of these is that, like most symmetrical scales, these lay out in a very visual way so if you know these two-string patterns you can find your way around the whole neck pretty easily. What's to be done with all these weird scales? There are 8x7 = 56 modes here but I don't think it's necessarily helpful to think of them that way. It's not as if the root notes are going to have any particularly strong tonic function. In the past this probably steered me away from structures like these -- how would I use them in a jazz progression, after all? But now I'm embracing atonality more explicitly I don't see it as a disadvantage. Eurean, Keikian and Lipsean all have the property that playing two copies a tritone apart covers all twelve notes. 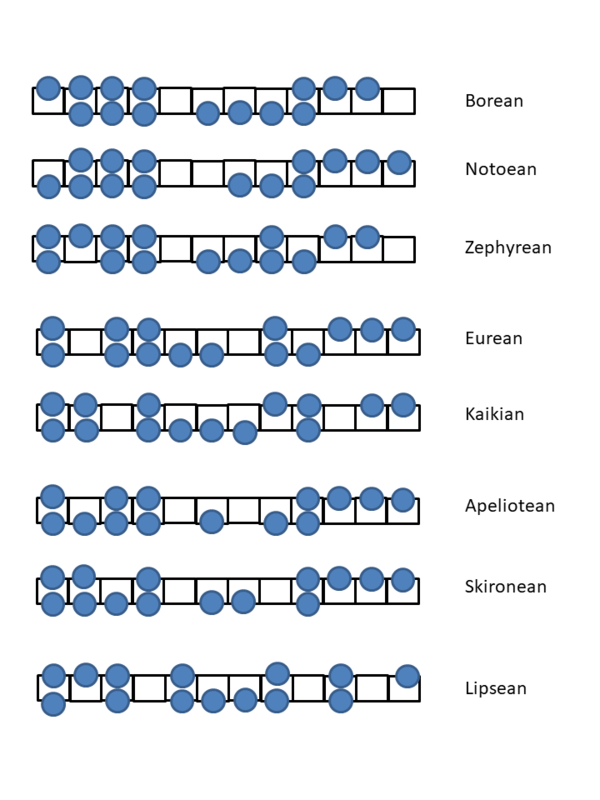 Of course there are two overlapping notes; in the case of Eurean and Lipsean, one of these is the root, but VI Keikian is a hypermode of I Keikian. Lipsean's coscale is also, of course, a subset of Mixolydian, so the major scale provides a kind of "expanded coscale" to Lipsean. And this led me to notice that Lipsean is Major Pentatonic with an added 4 and b5, which makes it very easy to find and play. I missed it out of this analysis because I used Spectral Analysis of Scales as my guide and that doesn't include anything with three or more consecutive semitones, but I should really have double-checked. Of the other five, though, not only are there no 2-overlap transpositions (so no way to play two transposed copies and cover the whole chromatic) but it's even true that none of the "eight winds" contains any of the other's coscales. Borean and Notoean have coscales with three consecutive semitones; since they're pentatonic, that means four notes seperated by semitones plus another somewhere else. These aren't very easy to make music with. But the other coscales are at least a little bit interesting.